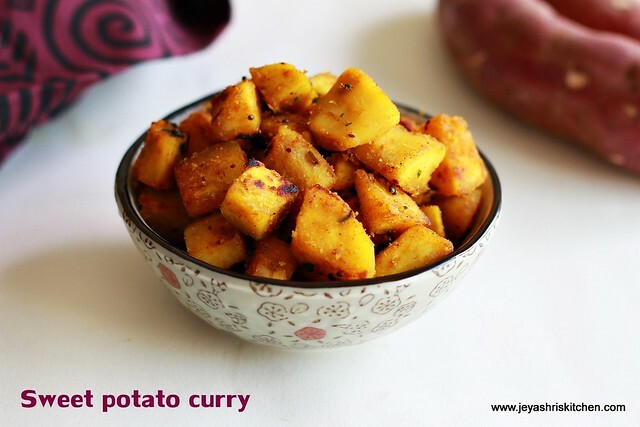 Sweet potato curry | Sakkari valli kizhangu curry is one my mom makes during pongal festival. The version she makes is with jaggery and will be like a sweet halwa. Though i like that but i can't take it more as i feel it is too sweet for me. 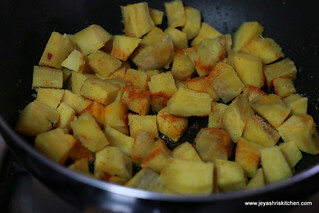 This version of making curry like how we make potato curry, i gave for the no onion no garlic recipes supplement, which i did for kungumam thozi.. 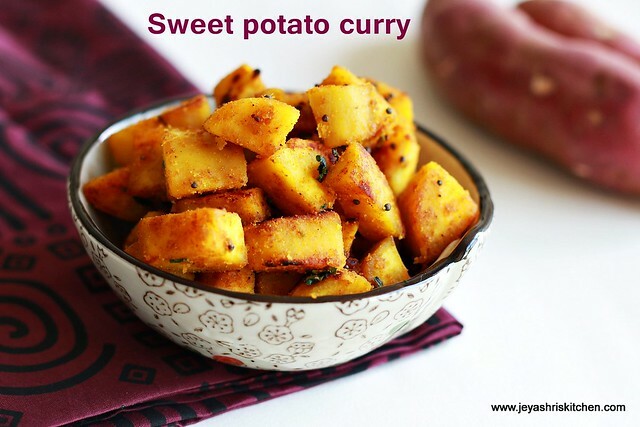 So Since now the sweet potato is season and also pongal festival is coming up , thought of posting this sweet potato recipe today. Pressure cook the sweet potato till 2 whistles. Ensure not to cook this too much , else it will be mashed. The best way to cook is wash the sweet potato and keep it inside a vessel and sprinkle little water to this. 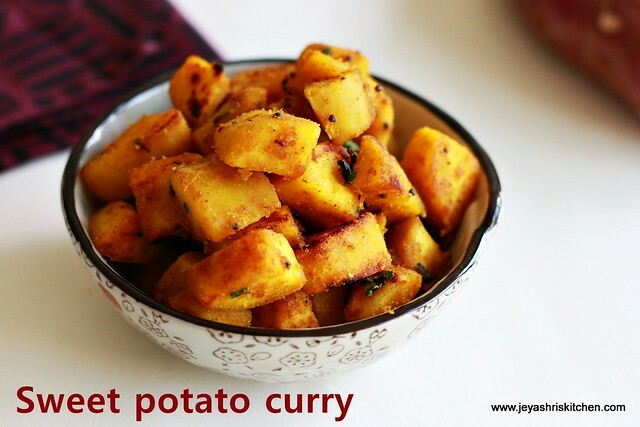 You can cook this even with rice and dal too. That is it won't get mashed even after 5-6 whistles if u make in this method. If u put directlyi n the cooker it will be mashed soon. 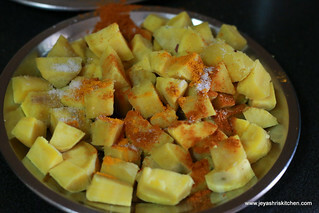 Add sambar powder, salt and turmeric powder to this. 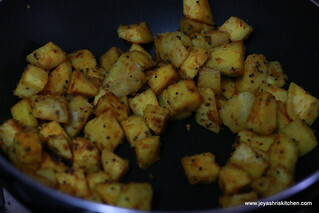 In a pan add oil and add the mustard seeds, When it splutters add in the sweet potato mixture. Mix well so as the powders coat to the sweet potato evenly. Cook in a low flame. 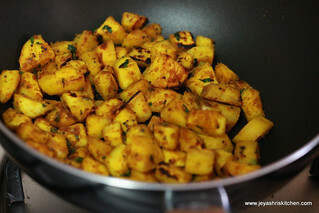 Cook for 5 mins and add the chopped coriander leaves. Cook till it is evenly roasted. It will take 7-10 minutes in a non stick pan. Sweet potato curry is ready to serve. It goes very well with sambar rice and rasam rice too. Take care not to overcook the sweet potato. The curry will not taste too sweet. 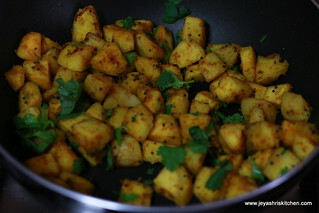 Came out very tasty... Little sweet and spicy sambar powder combo glued very well. We loved it!! !